Blackberry, no doubt, is such a smartphone brand that most of the people want to have a device bearing this name in their hands even today, but they do not found any device capable to fulfill all the requirement and need of today. The canadian company want to make their space in market and it is surely their sane decision to introduce aan Android phone. 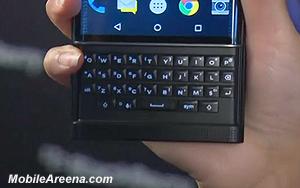 The BlackBerry Priv, the Blackberry's first ever Android device was just officially confirmed one day ago, and the company's CEO has now appeared in a video with a live "Blackberry Priv" in his hands. Johny Chen, the CEO of struggling the canadian company, tried to show the phone in action, but obviously new to the OS, kept saying that the Priv "runs Google" instead of Android. He also had trouble running Chrome on the demo unit, and it would have been nice if they had given him an already set up device, instead of one fresh off the assembly line. Anyway, the chief officer managed to demonstrate that the Priv's sliding mechanical QWERTY keyboard has capacitive sensors as well. So much like on the Passport, you'll be able to use it for gestures without pressing the keys. If the video player below gives error, Click here to Watch the video.